I really wish more songwriters would sit down and do this. Sometimes you listen to a song, make an interpretation in your own head as to what it's about and rarely do you ever find out it it's right or wrong. In this book Hugh sits down and discusses each song - sometimes at some length, and many times after not listening to it for years. For me, this was really interesting and made me want to revisit all my Stranglers albums... and my youth but that's another matter. I'd definitely recommend this to any fan of the early Stranglers, maybe not so much to the casual fan - although there's nothing to stop you from using this as a reference guide to look up just the songs you like. I really liked that it was written chronologically and split up by album and that the conversational style often let the story wander slightly off topic and gave you an insight into the workings of the band at the time. The story about looping tape around pencils in the studio to create a longer drumloop was a real eye-opener - I had no idea... and where else would I have found out. Well worth my $ and my time reading. This is probably my all time favorite band and some of the lyrics have been a mystery until now. Hugh Cornwell is an intriguing, funny and likeable guy and provides insight into not only the lyrics but how the songs were written and recorded in the studio. Highly recommended for Stranglers fans. 5.0 out of 5 starsA great Band Song By Song! I really enjoyed this overview of The Stranglers song catalog, As told by Hugh Cornwell. I thought it might be dry and sort of boring in some respects, but I was thankfully Wrong! I found myself re-exploring songs and albums from a new jumping off point. Hugh speaks in actual musical terms, he addresses lyrical content, inspirations, as well as the cultural world of Music while they were being created. I have loved this band for so long so I was thrilled to see this book available in America. Never just another Punk Band, The Stranglers should be part of your Life, like they were part of Hugh's, and mine! The Stranglers have a great body of work. This book is somewhat Beatlesque in that it delves into who wrote what song or what part of the song. The songwriting duo of Burnel/Cornwell is not as prodigious as John and Paul or Richards/Jagger but they are in the pantheon of great songwriters. 3.0 out of 5 starsCornwell Does Not Tell All, But He Does Not Need To! 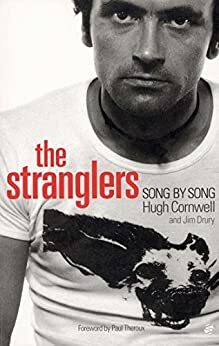 As a fan of Hugh's music I truly enjoyed reading this.He tells the history of each song instead of a biography of The Stranglers. If you are a big Hugh fan as well you need this. A casual fan or someone looking for a true band biography should read No Mercy.